I’m sure we have a few Cupcake Wars fans out there, so if you watched this past Sunday’s show on the Food Network, then you’re in for a treat! 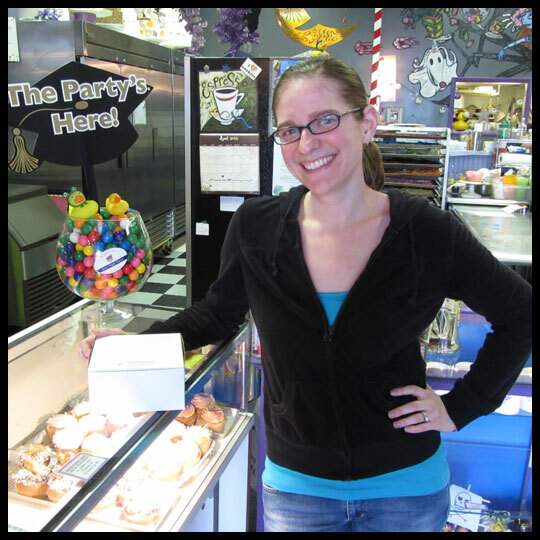 Shannon, owner and baker of Starry Night Bakery and Coffeehouse who competed for the second time this past week, took some time to answer questions for us. Most of you know by now how often I treat myself to cupcakes and coffee at Starry Night. I’ve also had the opprotunity to share my love with the other Crusaders, so we were all very excited when we found out they would be on Cupcake Wars for the second time. Everything was hush-hush prior to the show airing, but I had a feeling that this would be a redemption show. On Saturday we picked up our Cupcake Wars cupcakes (flavors from their first show) to have our own little celebration Sunday night. Well, it took me less than 10 minutes to devour my two cupcakes, the Mahoo Wahoo and Engery Drink. In this episode the challenge was to incorporate pork BBQ to represent southern flavors. The winners would be taking their cupcakes to the CMA (Country Music Achievement) Awards in Nashville. Right after finishing my cupcakes, smacking my lips, and saying, “Pork?! Shannon’s got this!” came the round 1 elimination. The judges all seemed very pleased with the flavors Shannon and her assistant, Amber, came up with: a sweet potato cupcake topped with BBQ honey glazed ham shreds, maple buttercream frosting, crispy fried prosciutto crumble and a torched marshmallow. Unlike the cupcakes created by some of the other contestants, it looks like something I would really enjoy, a perfect balance of sweet and savory. The judges’ only critique, and a small one at that, was the texture of the frosting. So, you can imagine my surprise (and the surprise of many) when Starry Night was sent home. Crusaders: Have things changed in the bakery since your first episode of Cupcake Wars aired? Shannon: Things at the shop have been crazy! Saturday mornings and afternoons are awesome because we get to meet so many new faces. People have spent 2-3 hours to travel here, just to have coffee and cupcakes! It is really cool to see little kids get so excited about seeing the shop. Before Cupcake Wars we really didn’t do that many cupcakes. Cakes and desserts were the main focus of attention. Now I am having a blast dreaming up new flavor combos and decorating ideas. We offer 15-20 variations daily. Crusaders: Were you asked to appear on the show again or did you have to re-apply? Shannon: They called us and wanted us back. For the short time it was, we had a blast filming again. Crusaders: What do you like to do to get ready for the competition? Shannon: We knew from last time to get plenty of sleep and have a TON of coffee in the morning! Being on the west coast on east coast time is not easy! Flying out super early and still being up super late takes its toll. Last time was very stressful and rushed…this time we went with a more laid back, enjoy the journey attitude. Crusaders: What was it like going back a second time? Did you feel more prepared since you’ve been through the process before? Shannon: Going back we knew exactly what we were getting into (which makes me question my sanity!). We knew what to bring, what to wear OR NOT WEAR (new Vans on concrete floor for 12+ hours shooting….PAIN)! Crusaders: Did you return to the show with hopes of redemption, after coming so close last time? Shannon: Heck yea we wanted redemption! We got edged out by someone who lived 5 minutes away from the set and had been there before! I wanted the win, but really didn’t feel it with the CMAs. It was like getting to candy land and finding out you have to go through in the dark…no fun! Crusaders: We love the Mahoo Wahoo and Energy Drink cupcake from the first episode! Will you be offering any cupcakes from the new episode? 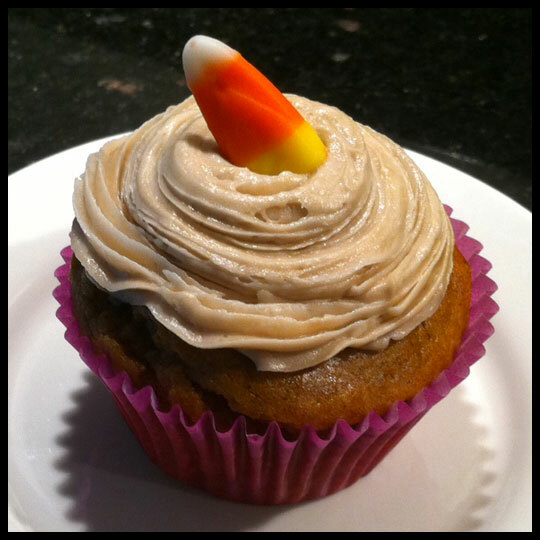 Shannon: We will be offering our Sweet Potato cupcake with Maple Buttercream. 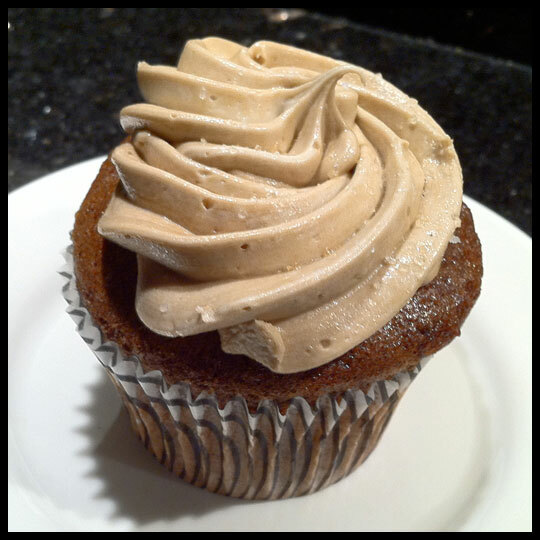 It is the same buttercream we featured last fall on our Sunday Morning Pancake cupcake, Pumpkin Spice & Maple Covered Bacon Chai. Over the weekends we will offer the Pork BBQ version as well. Crusaders: Most pastry chefs and bakers would be worried at seeing pork as an mandatory ingredient, however after your corned beef cupcake, I know you appreciate savory as well as sweet. When you saw the pork, were you nervous or excited? Shannon: I wouldn’t say I was excited…I was kind of let down. Pork! Again! We did a spam slider last time topped with bacon. I wanted it to be something new, exotic, and fun! After playing with so many flavors and combinations at the shop, having to use only one ingredient really didn’t seem thrilling. I was going to make mac & cheese as the “icing”…maybe I should have gone with that! Shannon: This whole experience has really given me new life and growth in the shop. It has opened doors, huge doors for us, to play and dance through! I am really happy with the amazing crew I get the pleasure to work with everyday. My job is never boring. Sometimes stressful and chaotic, but never boring. I am living my dream…I get to play in my very own candy land everyday, help local charities, and make people smile. It doesn’t get any sweeter! As I told Shannon, one of the reasons Starry Night is such a favorite for many of us is the feeling you get walking into the bakery. You can tell how much fun they all have, from the friendly team to the eclectic decor. While we wish they had gotten the redemption they were seeking, it doesn’t matter to us and they will always be winners in our book. And who knows, maybe their chance will come again? 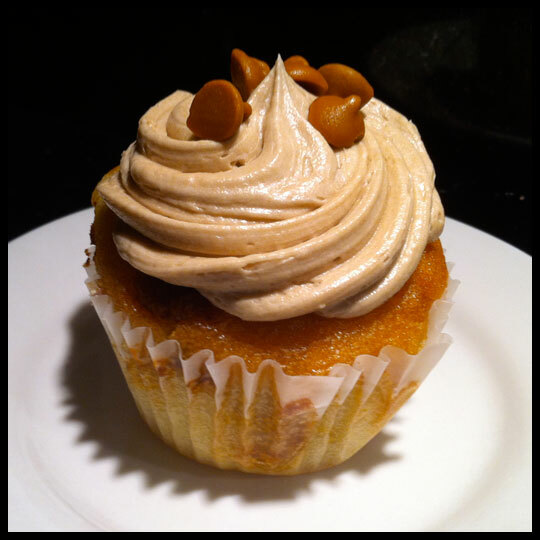 In the meantime, I can’t wait to try their sweet potato cupcake, so keep an eye out for that! 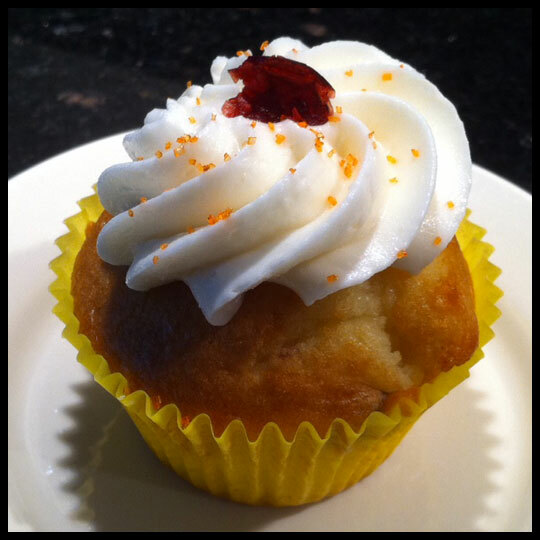 One of our many cupcake outings this month led us to Old Mill Bakery Café in downtown historic Ellicott City. Guest Crusader, Beth, recently shared cupcakes of hers from this location, but we decided to check it out for ourselves. When we walked in we were surprised to find out that this isn’t your normal bakery. It is a bakery, a coffee shop, and a gift shop all wrapped up into one whimsical place. We browsed the large merchandize table as we waited in line, drooling over the plates, mugs, wall hangings, and more that featured cupcakes. After we reached the front of the line we asked about the cupcake options for the day. They didn’t have any flavors posted, and clearly cupcakes aren’t their main thing. The nice woman told us our options and we settled on three flavors: Red Velvet, Chocolate with Vanilla frosting, and Butterfinger. The cake in this cupcake was airy and moist. Crusader Jenn said that it was the best Red Velvet she has ever had. However, the competition was a little tougher for our Red Velvet Crusader, Elisa. She really did like it but felt that the cream cheese frosting was a little too sweet, but luckily still maintained a nice cream cheese flavor. We all thought the shaved chocolate on top was a nice touch. 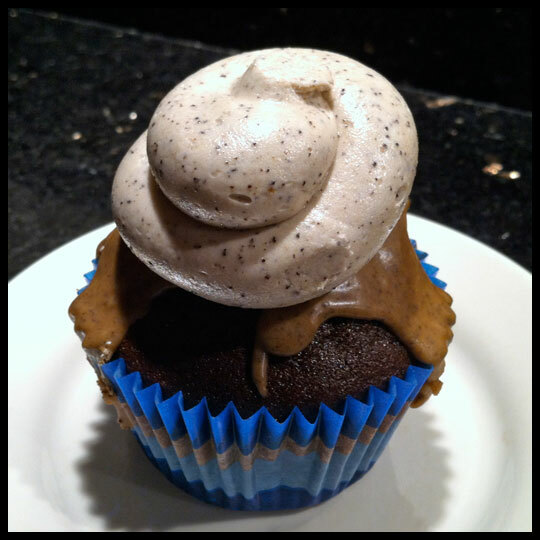 This cupcake shocked us by tasting much more like a Cookies and Cream cupcake. 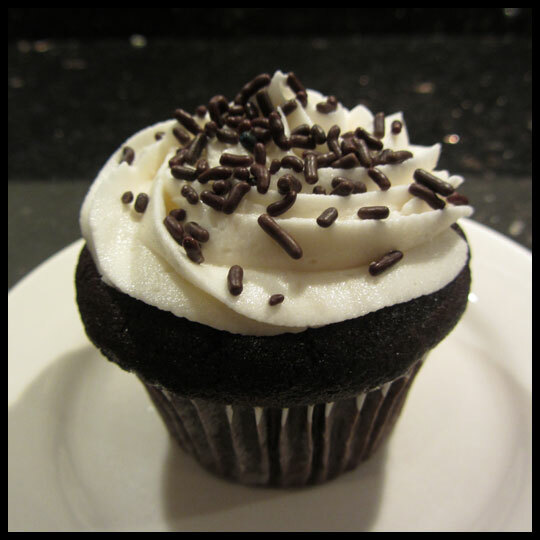 A really good Cookies and Cream cupcake! The vanilla frosting tasted just like the center cream of an Oreo cookie. The chocolate cake was light and flavorful, but a little crumbly. That didn’t stop this from being a very tasty cupcake though. 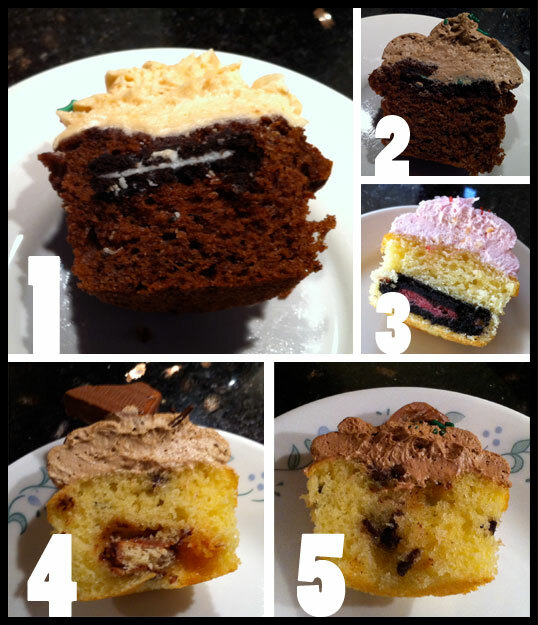 This cupcake was the clear winner of the three. Even though the cake was a little dry, the flavor and aroma was unbelievably wonderful! 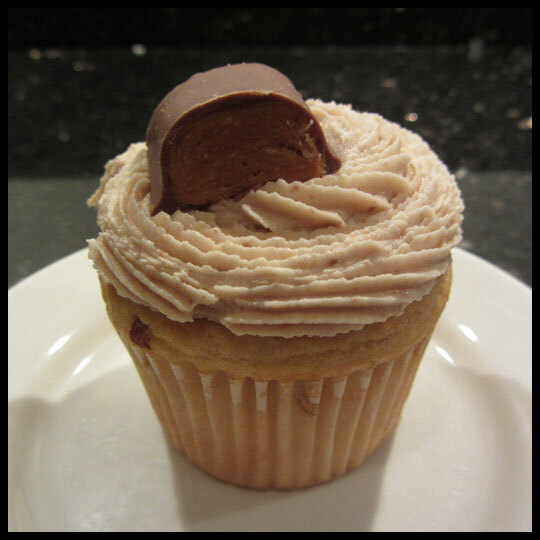 It was packed with so much Butterfinger flavor that it is definitely up there as one of our favorite flavors. The half of a mini Butterfinger on top finished the whole thing off nicely. Our overall experience with Old Mill Bakery Café was definitely a good one. Since we were on a time crunch that day we didn’t have a chance to sit and enjoy our cupcakes with a nice coffee or a cup of tea, but I look forward to returning to do just that. Historic Ellicott City is one of our favorite places to walk along the main street and browse the boutiques and antique stores. Old Mill Bakery Café will certainly be added to our “must do” list when we are there next. Halloween is everywhere today. Kids (and adults) are all dressed up, either waiting to receive loads of candy tonight, or just hoping to put a smile on someone’s face. Houses are decked out, candy bowls are waiting by the front door, pumpkins are carved, and even the cupcakes are celebrating. 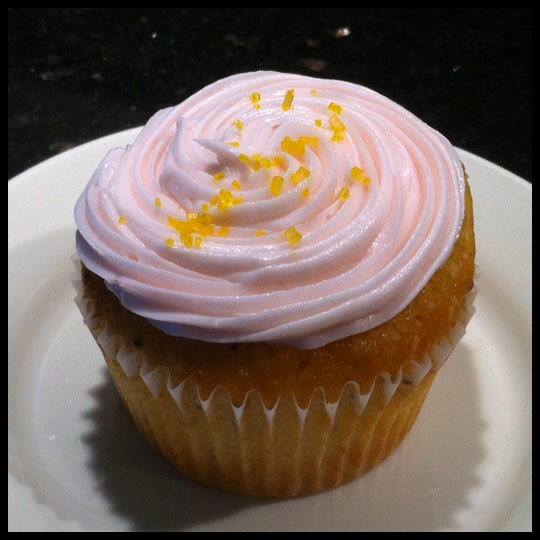 Today’s post will showcase cupcakes from 6 different locations ranging from the most popular (like Georgetown Cupcake) to the simple neighborhood grocery store, and everything in between. The idea for this post came about becuase I heard my local bakery not only had Halloween themed cupcakes, but they also had special Halloween boxes to put them in. I had to go check this out and we decided the other crusaders should see what they could find. We hope you enjoy our collection of spooky sweets! As I mentioned above, I found out my neighborhood bakery, Hamilton Bakery, created themed cupcakes and were placing them in colorful Halloween boxes. I decided had to have one for myself. 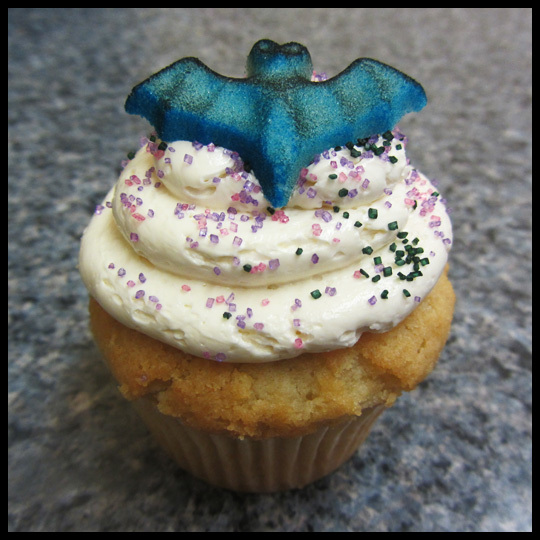 They only had the classic Vanilla/Chocolate flavors adorned with creepy fun, so I choose a Vanilla Vanilla with the Bat. 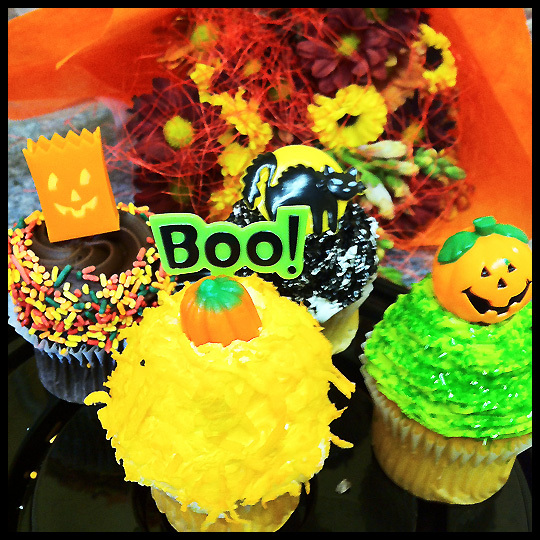 Today was my boss’s birthday, and she loves having a Halloween birthday, so today we surprised her with cupcakes (of course), flowers, balloons, candy, the works. 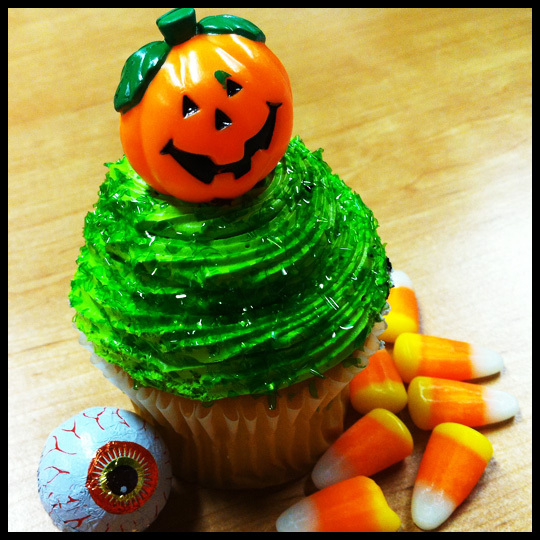 I was so glad that Fresh & Green’s decided to join in the Halloween fun and dress their cupcakes up for the occasion. I heard from my co-worker that the Chocolate Chocolate with the Trick or Treat Bag was delicious. 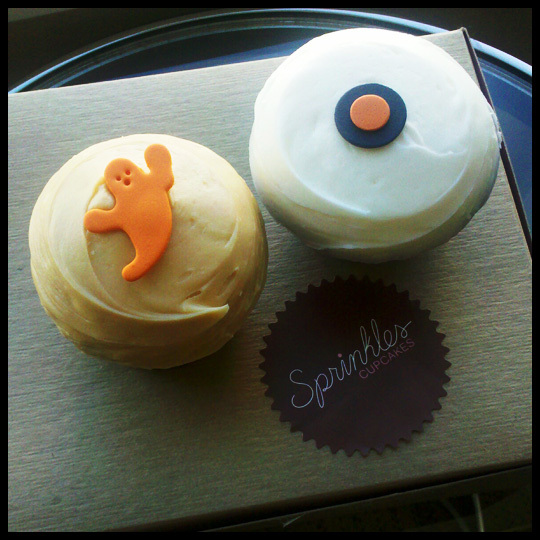 I opted for the Vanilla Vanilla with the Green Frosting and Jack-o-lantern. Doesn’t he look so happy? 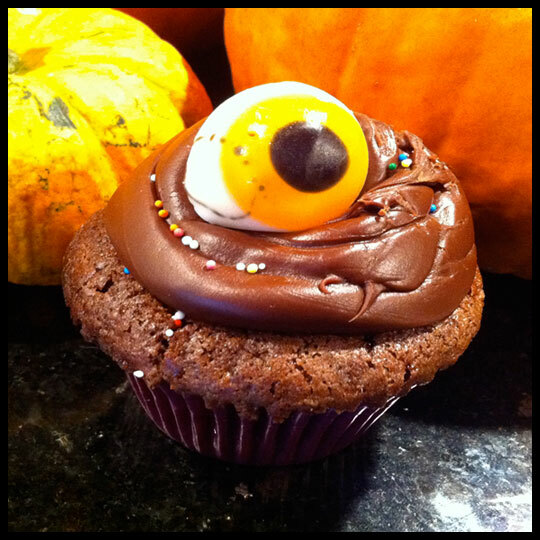 And it wouldn’t be Halloween without some Candy Corn and Chocolate Eyeballs to wash it all down with. The cupcake was decorated with a plastic, confetti-like, edible sprinkle. I’ve had edible glitter and edible gold, but I’ve never had edible plastic before, so I was a bit skeptical. After biting into it, the edible green stuff seemed to stick to my teeth, but it quickly dissolved. I’m not sure if this would be okay on a normal day, but for Halloween, it was just fine by me. The cake was the typical fluffy cake they had before and the frosting was the same wiped cream that I tend to enjoy. I was a little disappointed to see that their price has increased from $.99 to $1.50 per cupcake, but I’m going to assume that is becuase of all of the added decorations. And still, at $1.50 for these cupcakes, it puts them at half the price of most cupcakeries and bakeries. UPDATE: Fresh & Green’s Hampden location is now closed. 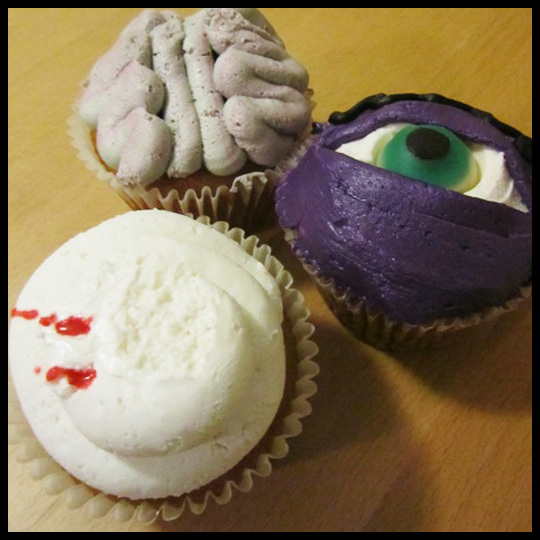 I had bought two seeing eyes, two exposed brains and two vampire bites. They were out of mummies and spiders. The bartender at Captain Larry’s handed them to me unceremoniously in a plain styrofoam container (slightly squishing the brains and bites). 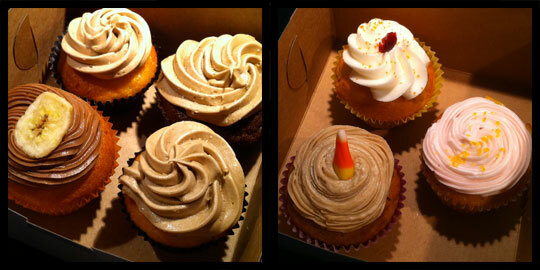 I brought these crazy cool cupcakes home for further investigation and, you know, tasting. I selected the brain to sample first. Mmm. It was a great surprise. Frankly, I started to think zombies might be on to something! It was huge, moist and flavorful. The madagascar vanilla bourbon spice frosting doesn’t just look killer. It was in good proportion to the cake and not so sweet that I didn’t want more. Inside, the cupcake was vanilla spice pumpkin with a pumpkin cream filling. 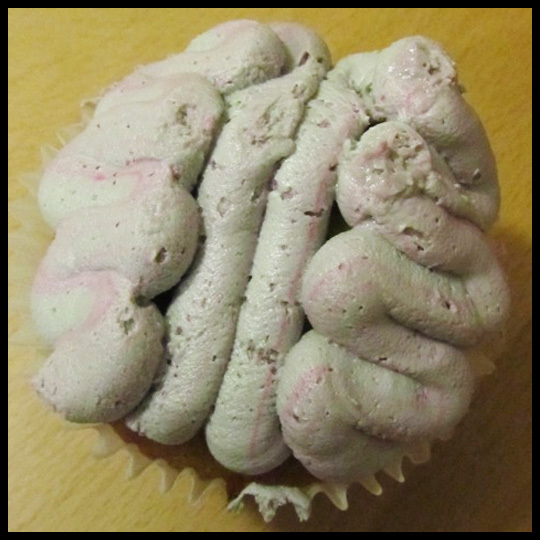 Every bite of this delicious brain was good. Almost worth an arm and a leg, even! Though Pirate Cupcakes loses a few points from me for presentation that doesn’t reflect the awesomeness of its super icing design, it absolutely gets this crusader’s thumbs up. Somebody bring me more body parts! 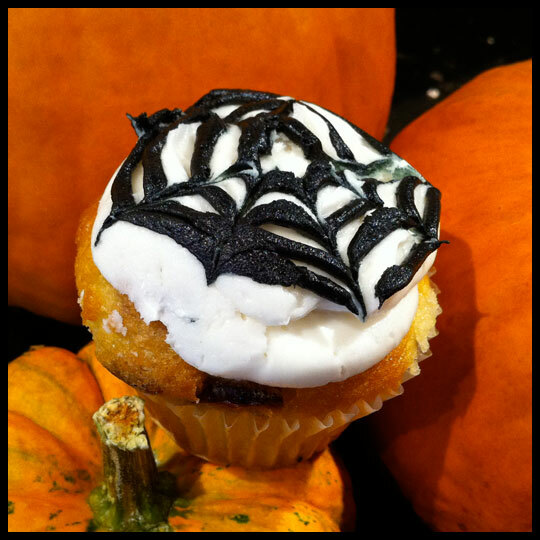 Hearing that one of my favorite local bakeries, Starry Night Bakery and Coffeehouse, had cupcakes decorated for Halloween, I decided that I should head over there and check them out. 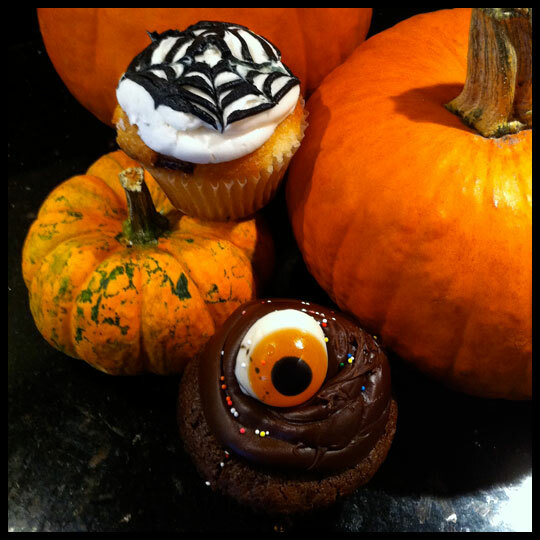 There wasn’t a big selection of varying decoration, but I did manage to get a seasonal favorite, the Orange Cranberry , with a spider web and also ventured into their standards section for a chocolate cupcake with a chocolate ganche frosting and gummy eyeball. The Orange Cranberry appeared in our original review of Starry Night and this is the third time I’ve ordered it. I think that speaks for itself! 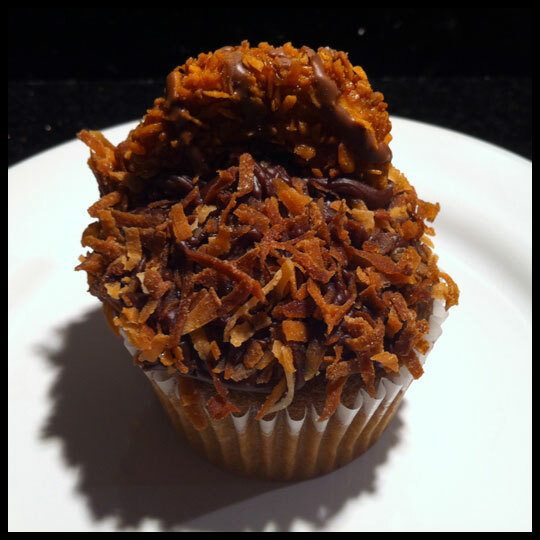 The chocolate cupcake was the first time I’ve ordered something from their standards and I have to say…YUM! While the cake was your standard chocolate cake, the icing was something between what you would find on a Berger cookie, a Baltimore favorite, and a chocolate frosted donut. Although the decorations were on the minimalistic side, I fully enjoyed the taste of both of my selections and still had fun picking out which Halloween themed cupcakes I should get! While they are on the more simple side, and not something I would normally order, they where simply tasty! The cake was moist, the icing was just what I expect from Georgetown, and they are the perfect size and price (in my Crusader opinion). 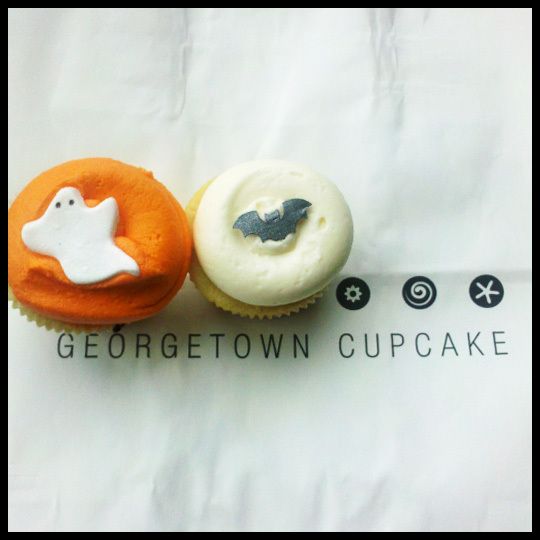 I was very lucky that I got the LAST one with a ghost decoration and the orange icing – Lucky me!! 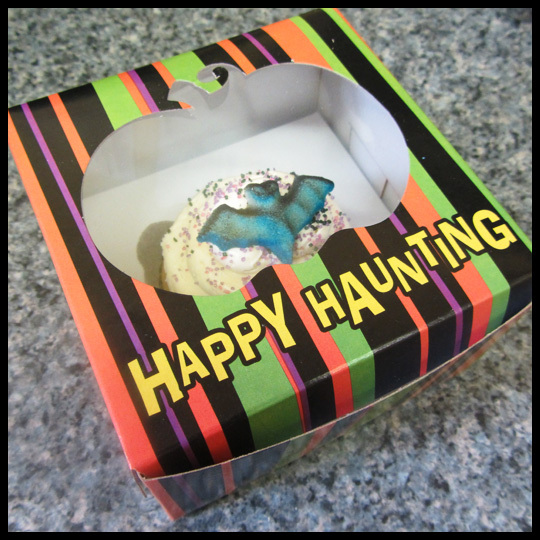 The cupcake decorated with the Ghost is Caramel Apple and it was YUM! Apple-y delicious moist cake with a smooth dreamy caramel frosting. This is one for the cupcake record books! The one with the signature Sprinkles Cupcakes‘ circle done in orange and black is Red Velvet. It was super moist cake with subtle cream cheese icing. 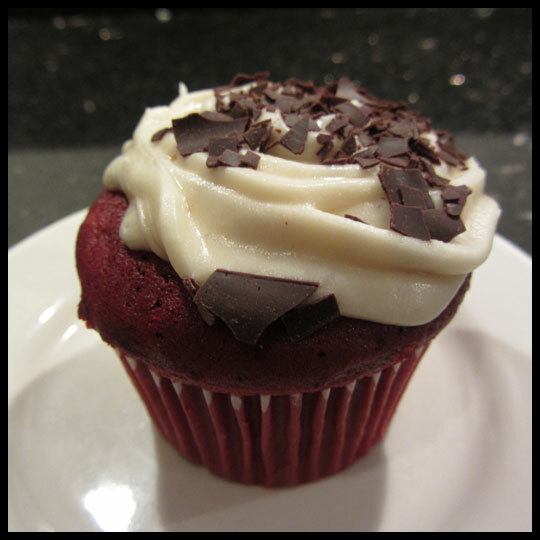 This has easily moved in as my second favorite Red Velvet. I’d go back for them again! Over all, the decorations were simple, but were on anything-but-simple cupcakes! We hope everyone enjoyed our collection of tricky treats. It’s not too late to go out and find some of your own! My experience with Starry Night Bakery and Coffeehouse began over a year ago. I was in search of a cupcake place in Westminster. There are plenty in Baltimore City, but living outside of the city I was curious about what local cupcake bakeries my town had to offer. I stumbled upon Starry Night Bakery and Coffeehouse and the reviews seemed good, but considering my cupcake experiences I was skeptical. Their website, while very creative, didn’t give me any details about flavors or even store hours. So one day, on my way home from work, I stopped in. I was very please with the selection, made a few choices, and brought the cupcakes home. I had mixed feelings about the cupcakes, mainly because one of the flavors had a raspberry filling, but it was way too much filling. I recall that particular cupcake being too sweet between the jam filling and the icing. Fast-forward to today…I heard about Starry Night’s seasonal selection and was very excited about their Salted Caramel Apple. I’d just tasted Happy Cakes’ and thought if I could get something similar locally, that would be great. I also learned that since my last experience with Starry Night, they were on the Food Network’s Cupcake Wars! Now I was REALLY excited! I went in and ended up leaving with four cupcakes: Two of the Salted Caramel Apple (one for hubby and one for me) and two of their “Quirky” Cupcakes; a Banana & Chocolate (called Monkey Biznass – or something like that) and their Salty Caramel. 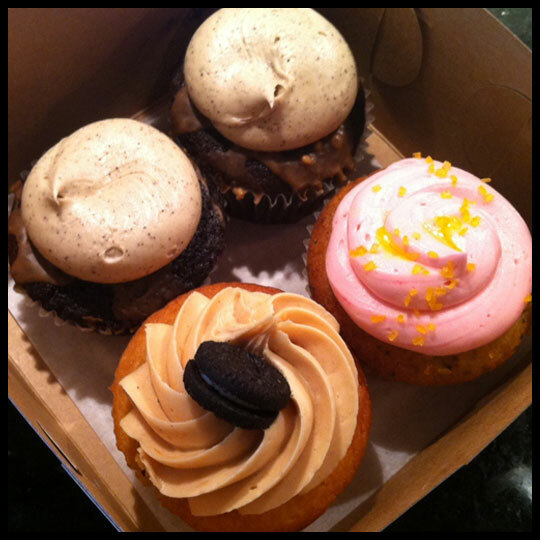 I later went back and decided that before reviewing these cupcakes I really should try the other two seasonal flavors, which also sounded delicious, and their Cupcake Wars cupcake, which seemed intriguing. For the sake of the review, instead of going in chronological order I am going to start with seasonal, quirky, and then end with their Cupcake Wars cupcake. The Salted Caramel Apple is an apple cake with a salted caramel buttercream. While this cupcake was delicious, I do think that it could have used more caramel flavor. I’m not a big caramel person, but I do feel like caramel lovers would find it lacking and think that a caramel drizzle could be the solution. Not only would it add flavor, but it would also bump of the decoration and get customers really excited about their seasonal selection. However, the salty with the sweet was worked out perfectly and the apple cake was very good, so all-in-all, a very good cupcake. The Orange Cranberry is an orange cake with dried cranberries and a buttercream frosting. The aroma of this cupcake let me know that it was going to be good. I could smell the orange and cranberry and the taste was no different! Again, perfect level of sweetness with the bite of the citrus and cranberries. After tasting this cupcake, I thought it would be my favorite! 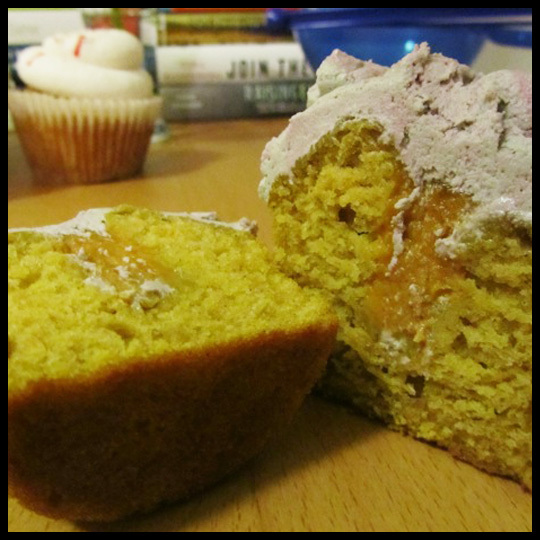 Lastly, the Pumpkin Maple is a pumpkin cake with maple buttercream. Yum! 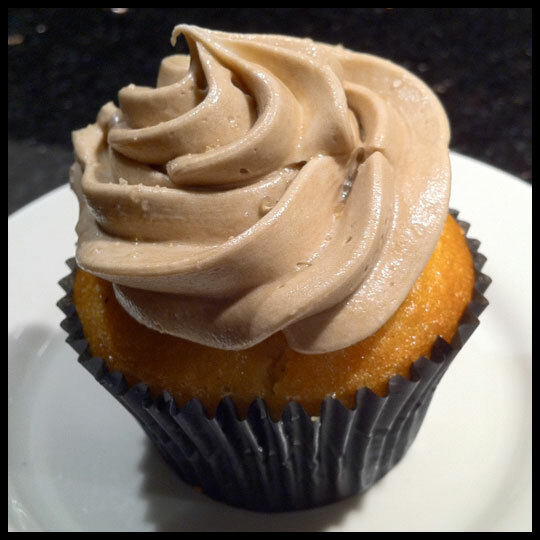 The Banana & Chocolate is a banana cake with banana filling and chocolate buttercream frosting. 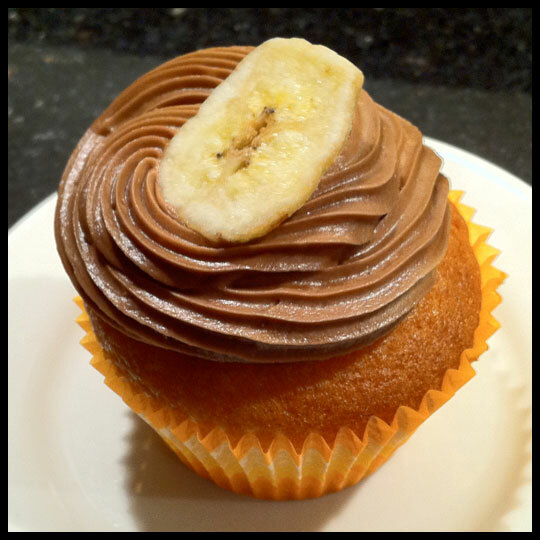 After tasting the banana cream separately I was a little worried that the banana flavor was too artificial, however altogether the flavors really worked to create a perfectly balanced cupcake with all of the banana and chocolate taste you’d expect. The banana cake was excellent! The Salty Caramel is a chocolate cake with caramel filling and salty caramel buttercream. I was a little confused by the filling and originally thought it was a chocolate ganche filling. I think this is due to the caramel absorbing into the chocolate cake. As with the Salted Caramel Apple, I think the caramel flavor could have been bumped up a notch, but the salt with the chocolate still really worked and made this cupcake very enjoyable. 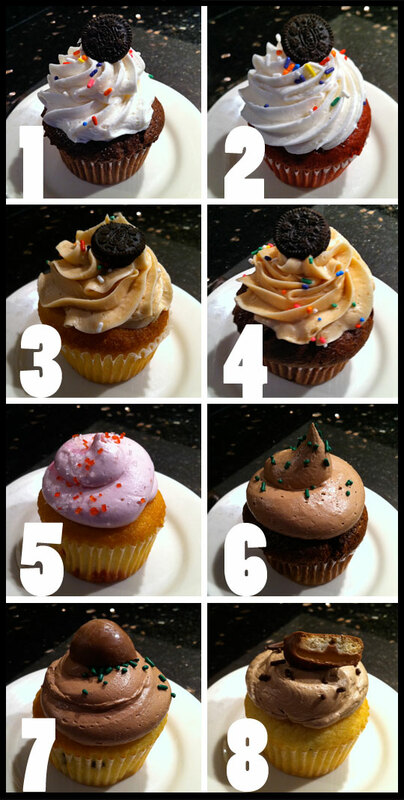 It looks like the “Quirky” Cupcake flavors are rotated, but they have some amazing looking combinations. I’m excited to try one that has chocolate and espresso. They also have their standard flavors, but who can even look at those with all the other interesting selections? As mentioned earlier, I found out that Starry Night was a competitor on Cupcake Wars. I thought this was so cool and wished that I had caught that episode, but sadly I did not and can’t find it online anywhere. While they did not win the competition, they did make it to the final challenge and according to Candance Nelson’s blog, it was a close battle. 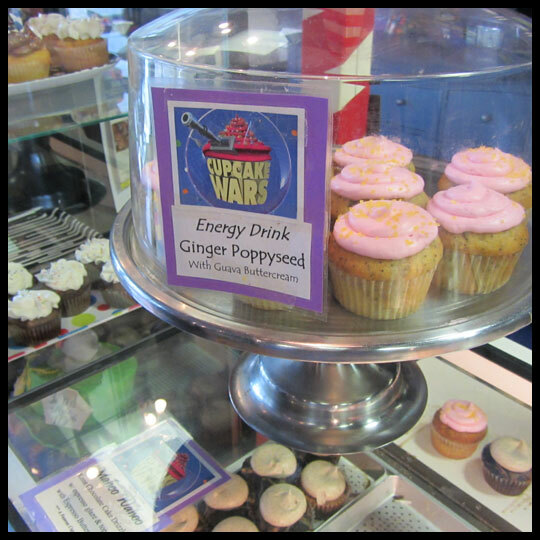 On my second trip there this week, I decided that it was mandatory to taste their Energy Drink cupcake, that they had created on the show. This cupcake is Ginger Poppyseed with a Quava buttercream. Sounds good to me! And, it was! While all might not appreciate the floral note to the guava buttercream, I do. It wasn’t overpowering in my opinion and I loved the uniqueness to it. I couldn’t pick up the ginger in the cake, but the poppyseed flavor was delicious and the guava really complimented it well. 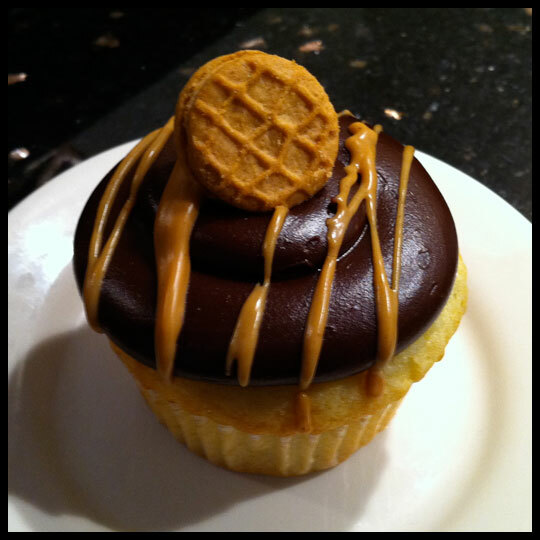 I believe that Starry Night has come a long way in a year and that they are a shinny star in the cupcake industry. 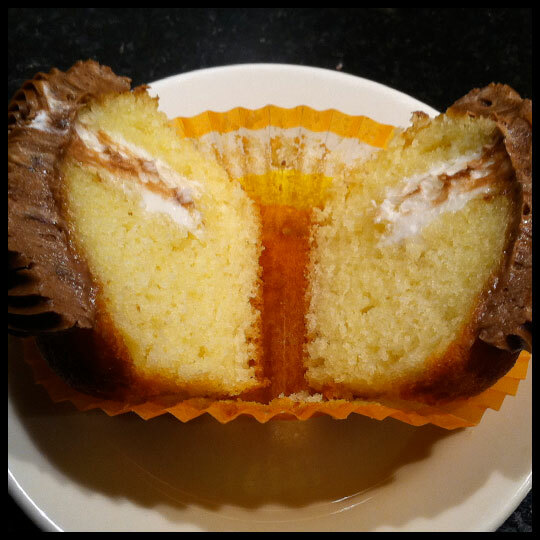 While there’s room for improvement in terms of bringing some of the flavors out fully, they make a perfectly balanced cupcake with moist cake that will have me coming back for more! Side Note: Starry Night also has a great coffeehouse selection and they really know how to make a good cup of joe with flavor combinations equal to their cupcakes!